I make no secret of the fact that I will endorse fully products that I feel help me be more effective as a server. In the past I have written about my favorite wine key, money clip, and slip-resistant shoes. So when a fellow server on Twitter was asking for a recommendation on some great serving shoes, I shared the link to my post on the topic. Realizing that I was still wearing the same pair of shoes I had written about, I decided to order a new pair. You can imagine my disappointment when I found that Reebok had gotten out of the slip-resistant shoe business. This was only matched by my surprise when I received a tweet from @srmax asking me to take a look at their shoes. I visited the SR Max site and was blown away by their selection. I have never been impressed by the quality or value of the shoes offered by the largest company in the shoes for restaurant crews business, but I decided to give SR Max a try. Worst case scenario is that I write a post telling you to avoid buying shoes from them. I would have no issues with writing a negative review if I was dissatisfied. Instead, I can say that I will never buy slip-resistant shoes from anyone but SR Max. When looking for serving shoes, details matter. You want to avoid logos. You want shoes that are professional, but casual. They need to hold a polish while repelling the random food stuffs that are likely to fall on them. Most of all, you need shoes that are designed to keep you safe on wet or greasy restaurant floors. The folks at SR Max have done their homework. They keep the logos small on their comfortable, yet stylish shoes. What really closed the deal for me was the amount of information they have online explaining why their soles are superior. You could tell they spent their time designing a quality product they were willing to stand behind. The shoes arrived in a few days and fit like a charm. They fit so well that I violated my first rule of new work shoes: don’t wear new shoes on Saturday night. My first shift in the shoes was a true test of their worth. I was working in the basement jazz club of my restaurant. This means that food went from the composite floor of the kitchen, to the linoleum of the hallway, down the plastic coated stairs, through the tile service area, and into the carpeted dining room. The first thing I noticed about the shoes was the incredible difference in weight. They weighed about half what my previous shoes did. They also provided great traction from the time I arrived. At the end of the shift, I noticed that I did not have any first wear blisters my feet felt great. I decided to put them to a different test the following weekend. I worked for a friend’s restaurant at The Plaza Art Fair. This is an outdoor art festival in Kansas City that draws a couple hundred thousand guests every year. Working a booth for this event in incredibly fast paced and leaves you on your feet for the entire shift. I walked down to the booth rather than fighting for a parking spot. I worked on my feet for the entire evening and then walked home. Not only did my feet feel better than anticipated, but the day’s grime wiped off with a moist towel. The final test I put them through was one they were never designed for. I was attending a casual fundraiser for a friend’s re-election campaign. It was also the afternoon of a University of Missouri football game so I donned my black Mizzou hoodie only to realize my selection of black shoes was more suited for a tuxedo. I decided to wear my new work shoes as a passable option. Not only did I feel comfortable in them, I even received a compliment on them. This is something I did not anticipate ever happening in reference to a pair of slip-resistant shoes. I now have a great pair of comfortable, good looking, well designed shoes that will keep me from falling on my toochis. As someone who has taken a fall on the job, I can appreciate a good pair of slip-resistant shoes. To find a pair that is safe and has all of these other advantages is more than I had anticipated. That is why I can fully endorse my new shoes from SR Max. I wear them and I like them. 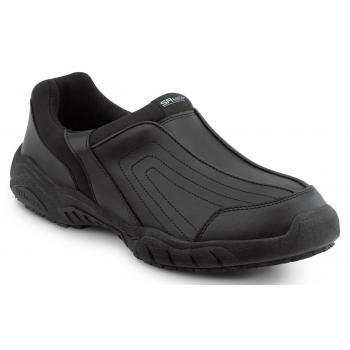 If you are in the market for a new pair of slip-resistant shoes, I recommend taking a look at their site. Your feet will thank you. Should Restaurant Servers Post Credit Card Receipts?